Two conjoined twin girls in the United States are in stable condition and recovering in hospital after undergoing a 17-hour surgery to separate them. 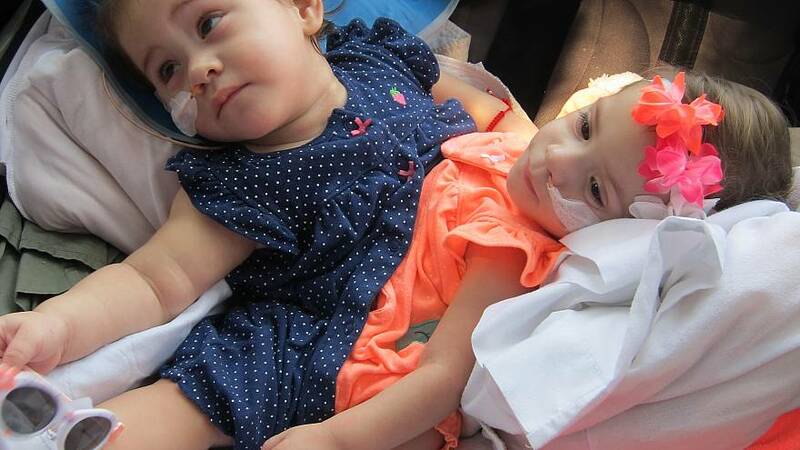 Two-year old Erika and Eva Sandoval from Antelope, California shared much of their lower body prior to their separation. The two were thoraco-omphalo-ischiopagus twins – meaning they were positioned facing each other and conjoined from the lower chest and upper abdomen. “Before separation, you could think of their anatomy as two people above the rib cage, merging almost into one below the bellybutton,” said Peter Lorenz, a plastic and reconstructive surgeon who led the reconstructive phase of the operation. Together they shared a diaphragm and some digestive connections, but they each had their own heart, lungs and stomach that culminated in two legs. To separate the twins, a team of 50 surgeons divided the twin’s shared bladder, liver, gastrointestinal and urinary tracts as well as their pelvic bones. The operation took place at Lucile Packard Children’s Hospital Stanford near San Francisco. The twins will spend four weeks recovering in hospital before going home, doctors say. The two are in the same hospital room, but, and for the first time since their birth, they are in separate beds.